We always want more than what we've been given. Mascaras come in a different formulas in order to satisfy what we want. There are ones that make lashed thicker, longer, and curl more. Mascaras also come in waterproof formulas as well as different color shades. How do choose the one that's right for your lashes? There's no need to be restricted to just one mascara. Having a different ones for whatever occasion might pop up, comes in handy. Your everyday mascara should be simple and fuss-free. Covergirl's Lash Blast ($6.94) is good for everyday use. It adds volume and length without being over dramatic. 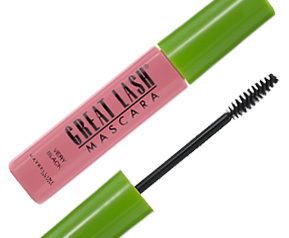 Maybelline's Great Lash Mascara ($3.94) is also a great everyday mascara. It lengthens a lot without the thick layering. There are also those occasions where waterproof mascara is necessary. Although makeup shouldn't be worn to water parks and the beach, a little waterproof mascara can open up your eyes without the worry of possible smudges throughout the day. Maybelline's waterproof mascara ($3.00)doesn't cost much, but it will last you all day. Adding a little color can do more than brighten your day. Benefit's BADgal Lash Mascara ($19) gives you color options. They have a blue mascara which is one of my favorites. The royal blue color pops instantly when you open the tube but it's actually quite subtle when applied to the lashes. The blue helps the white from the eyeballs stand out and make your eyes appear wider.